Many people take their pets on vacations, business trips, and on visits to family and friends. If you’re traveling with your pet keeping them safe is a significant concern. Most pets travel well, especially when able to stay with you throughout the entire process. These tips make the process less stressful for everyone and keep your pet safe. Ask Yourself, Is This Helpful? You may not need to take your pet with you on every trip. There are many options available to keep your pet safe while you’re gone. Before traveling with your pet consider alternatives such as a pet sitter or boarding facility. If your pet will be going with you, check to be sure that your pet is welcome at each of your destinations. When crossing state lines, a Certificate of Veterinary Inspection is required by law. This inspection is performed by your vet and verifies your pet is in good health, is not ill, and is up to date on their vaccinations and shots. This type of examination has to be current and performed within 10 days of the planned trip. During traveling your pet should be as comfortable as possible. Any restraints such as harnesses or carriers should be properly sized, secure, and ones your pet is used to. When traveling by car take regular stops so your dog can walk and use the bathroom. Have plenty of food and water on hand. A car trip is stressful enough for many pets and keeping them comfortable reduces any additional stress. Many pets suffer from motion sickness. If your pet is restless, salivates, vomits or vocalizes during car rides, speak with your vet about motion sickness medications to make the trip more comfortable. When traveling by plane consider the surroundings: noise and new people. Consider playing some sounds of airplanes taking off in the house for a few days leading up to the trip, so your pet is not alarmed by the noise. If your pet is typically frightened by noise— vacuum, thunder, etc— order a pair of dog ear muffs or noise canceling headphones. Be prepared for emergencies. A lot of problems are avoidable just by having current ID tags, a current picture for lost posters, and a microchip implanted in case they get lost. Don’t forget your pet’s medications. Be aware of the local vet office as you travel and when you arrive at your destination. On the day of the trip: Monitor food and water intake. You don’t want them to be dehydrated but you should restrict their water intake somewhat. If you’re traveling first thing in the morning they do not need to drink much before the trip. (Bring wet wipes or a potty pad just in case a clean up is needed). Exercise! Make sure your pet is able to get a nice, long walk or playtime to release some energy before the trip. This helps to have them tired and as relaxed as possible for the flight or car travel and allows them to empty their bladders before you leave. 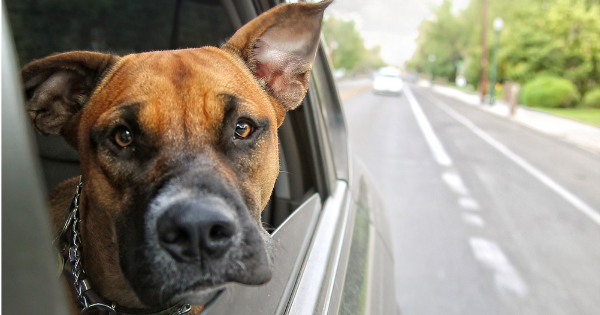 Traveling with a pet isn’t always easy, and their safety and comfort should take top priority. Make them as comfortable as possible. Most pets travel well, but it can be stressful. Consider having a familiar blanket or toy out during the trip. And for some pets, a ThunderShirt works well, which helps them feel secure and calms them down. With careful planning, traveling with your pet does not have to be a stressful experience for either of you!